A tree with five dollar notes representing an advertisement for a leaflet on facts on AIDS at Work by the Department of Health, New Zealand. Colour lithograph, 1990. Forget the fiction. Get the facts. We all know money doesn't grow on trees - equally we shouldn't believe the silly rumours about AIDS and how it's spread. 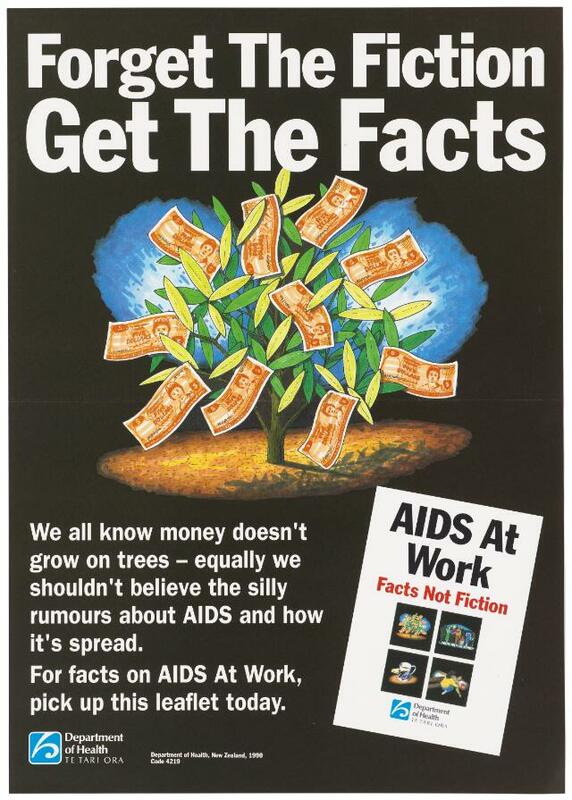 For facts on AIDS At Work, pick up this leaflet today. AIDS At Work. Facts Not Fiction. Department of Health Te Tari Ora. Department of Health, New Zealand, 1990, Code 4219.